View all components of MS Outlook i.e. Emails, Contacts, Journals, Tasks etc. Get 2 scanning options with PST file viewer i.e. Quick & Advance Scan. 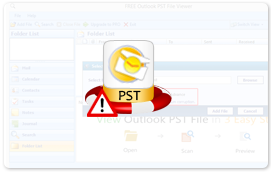 Get complete preview of all items of PST file with detailed information. Easily switch between screens, choose either Horizontal view or Verticla view. 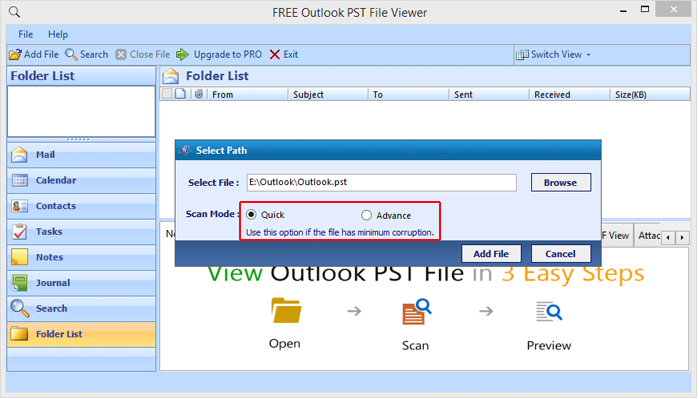 Now there is no need to install or configure MS Outlook to view/read PST file. Simple grpahical user interface of PST file viewer helps users in operating it. Outlook PST Viewer 2.0 Updated! Outlook PST Viewer 1.3 Updated! Outlook PST Viewer 1.5 Updated! Outlook PST Viewer 1.0 Released! 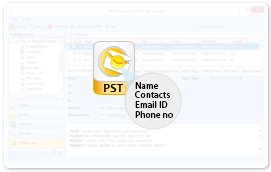 With MS Outlook PST viewer, users can view all distinct items of MS Outlook like emails, calendars, contacts, journals, tasks, notes etc. It provides preview of emails in variant views like normal, attachment, property, RTF, HTML etc. The original formatting remains unaltered. 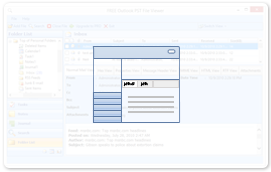 In PST file viewer, users are provided 2 scanning modes i.e. While performing scanning process, the hierarchy of file and folders remains unchanged. Once the PST file gets loaded, it displays entire items available in all folders and shows preview of it. All items can be easily viewed via its associated elements like, for emails it is from, to, subject, received, sent, size (KB) and for contacts it is like address, full name, phone number etc. 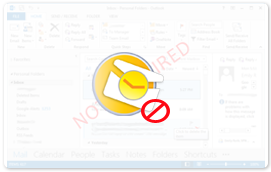 MS Outlook PST viewer doesn't require installation of Outlook for opening PST file. 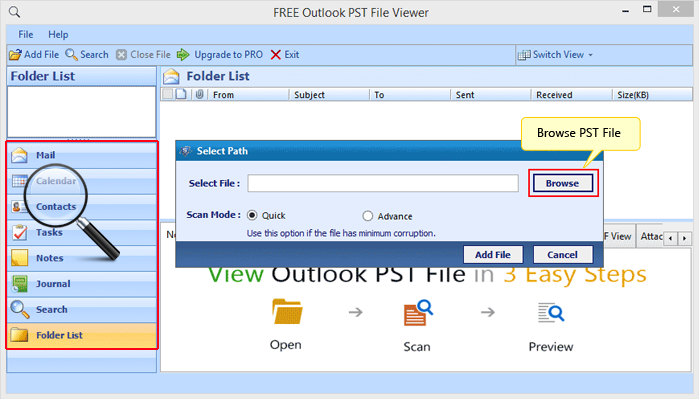 There are various Outlook based application which needs Outlook to be configured but free PST viewer doesn't have such condition to read Outlook PST file. The view of free PST viewer is alike MS Outlook. Its simple graphical user interface makes it user friendly and helps them in using free viewer for PST file easily. 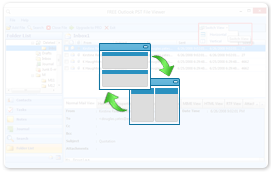 As an Outlook user, you will find PST viewer easy to use. 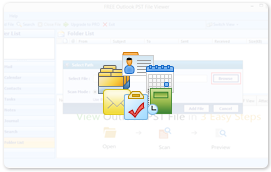 You can preview all elements of MS Outlook in similar manner. I need a PST file viewer with attachments viewer. Is this a correct solution for my need ? Yes, this viewer can help you easily open and read your .pst files with attachments. 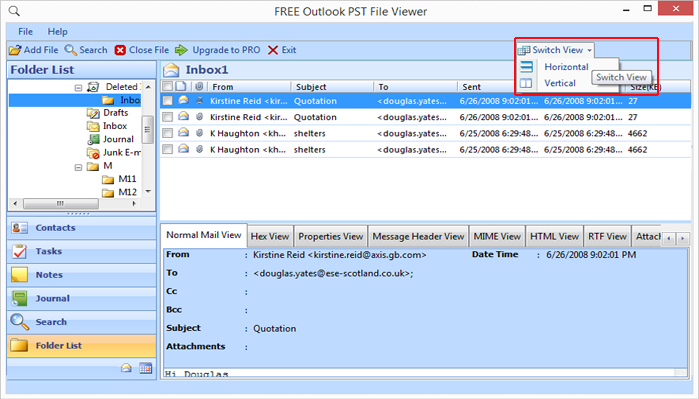 Using Attachment preview tab, you can easily view email attachments from pst file. Attachment viewer can help you view attached file contents by opening file in native application from within the free pst viewer itself. Do I need to have Microsoft Outlook installed, on same machine on which I am using FREE PST Viewer ? 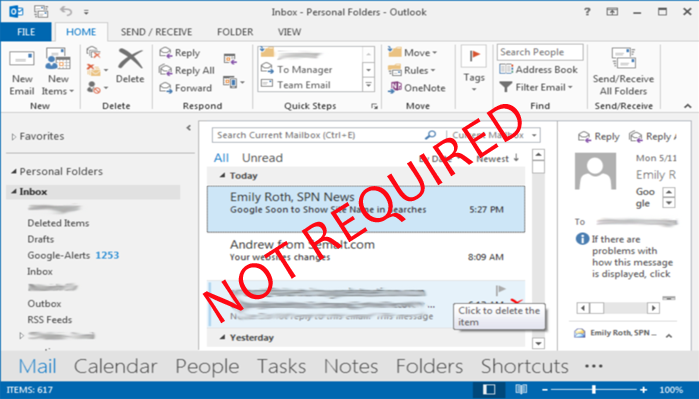 No, you do not need Outlook to be installed. Viewer is designed to read Outlook .pst files without requiring MS Outlook installation. 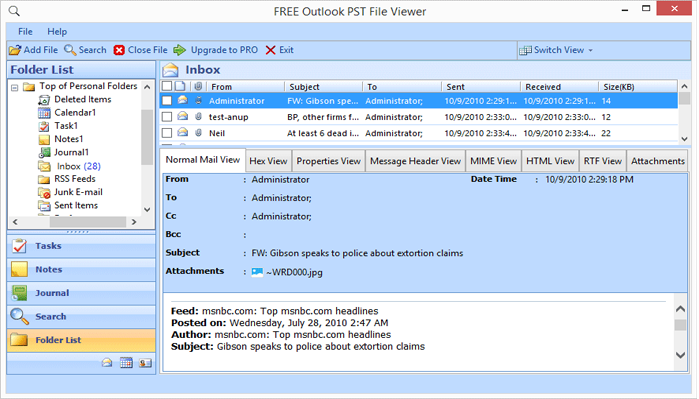 FREE PST Viewer reads binary file format of .pst file and understands pst file structure to recover and show every bit of Outlook file data. Is it Completly FREE to use this viewer. Copyright © 2018 FREE PST Viewer. All Rights are Reserved.